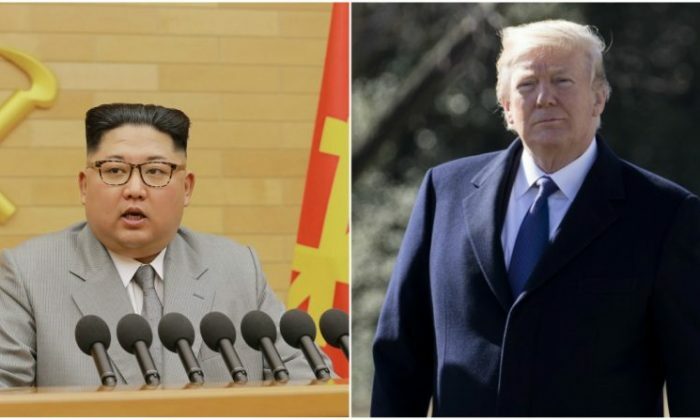 The meeting is the first of its kind since Kim took power in 2011 and the strongest indicator yet that President Donald Trump’s campaign to end North Korea’s nuclear weapons program is working. South Korea’s National Security Office head Chung Eui-yong and National Intelligence Service chief Suh Hoon met with Kim during a dinner banquet at North Korea’s capital in an effort to persuade the dictator to start talks with the United States about denuclearization, Bloomberg reported. The envoys also planned to discuss the release of three Korean-Americans imprisoned in North Korea. Monday’s meeting is the second engagement between high-level officials from the two Koreas in less than a month. Kim Jong Un’s sister, Kim Yo Jong, traveled to South Korea last month for the opening ceremony of the 2018 Winter Olympics and met the South Korean president. Moon credited Trump’s aggressive foreign policy for bringing about the talks where North Korea agreed to send a delegation to the Olympics. During her Olympics visit, Kim Yo Jong, the head of the communist regime’s propaganda and agitation department, invited President Moon to visit Pyongyang for a summit. Moon has not yet agreed but sent a delegation to discuss that possibility, Wall Street Journal reported. The South Korean envoys planned to travel to the United States to relay the content of Monday’s meeting. Kim has not met with any officials from South Korea or any foreign heads of state since taking power in 2011. The two Koreas held two summits between their leaders in 2000 and 2007. Kim Jong Un’s father met the South Korean president in Pyongyang on both occasions. Monday’s meeting started at 6 p.m. Seoul time, according to a spokesman for the South Korean president. The envoys arrived in North Korea via a special direct flight at 2:50 p.m.
Japanese Foreign Minister Taro Kono told reporters that denuclearization should be part of talks with North Korea. Chinese Foreign Ministry spokesman Geng Shuang told reporters that China is ready to play a positive role to reach the goal of denuclearization and lasting peace in the Korean peninsula. The United States and North Korea have both indicated a willingness to meet, but have been unable to agree on the terms of the engagement. The United States demands that discussion of complete denuclearization must be part of any talks, which has been a non-starter for the reclusive communist state. Tensions between the United States and North Korea escalated last year after Pyongyang carried out a series of ballistic missile launches and tested what it claims to have been a hydrogen bomb. In response, Trump threatened military action and spearheaded a series of stringent international sanctions. Trump views communism as a failed and destructive ideology and has highlighted the stark difference between the two Koreas as proof.